Protect sensitive skin while obtaining a complete clean with this Arm & Hammer 5 gallon perfume and dye free HE liquid laundry detergent. Not only is this detergent free of perfumes and dyes that can irritate delicate skin, its unique, low-sudsing formula is infused with Arm & Hammer baking soda. For added versatility, it can be used with standard or High Efficiency machines. Plus, the special dirt trapping agents provide a clean rinse for efficient, deep-action cleaning. It's strong enough to break down the toughest stains and odors for a fresh, clean wash every time. Great for schools, restaurants, hotels, daycares, and nursing homes, this liquid laundry detergent is the perfect way to ensure all of your linens, sheets, and uniforms are freshly laundered and ready to use. This detergent is designed to help remove food stains, grass stains, and grease, for a multi-purpose detergent you can depend on. Buying detergent in bulk is cost efficient and the best way to make sure you always have cleaning supplies on hand at your establishment. Arm & Hammer is a well-respected name is the cleaning world. This five gallon bottle is perfect for large capacity and commercial machines. It's low-sudsing formula makes it better for the environment. It's also great for those guests with sensitive skin. I highly recommend this product. 'Arm & Hammer is well-known for quality. 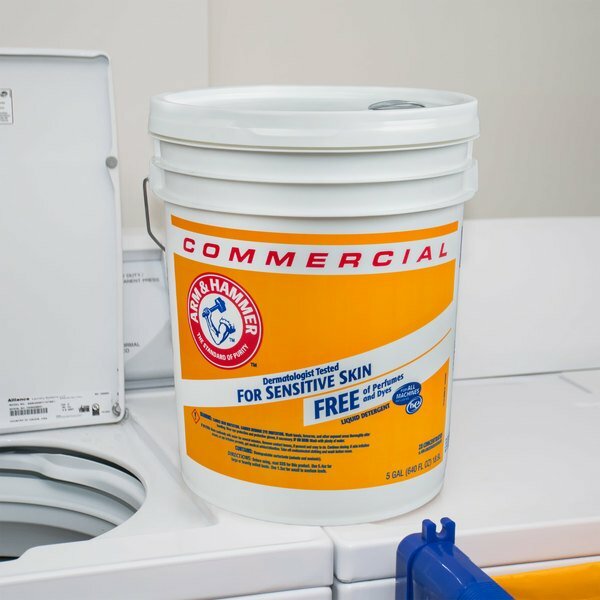 This five gallon container is great for commercial machines. It's low-sudsing formula is safer for the environment and it's perfume and dye free which is perfect for those with sensitive skin. Arm & Hammer is well-known for quality in cleaning. 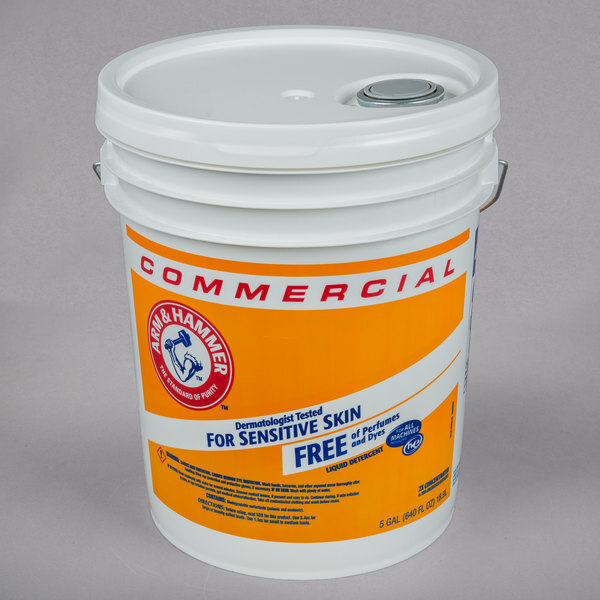 This five gallon container is perfect for large capacity and commercial machines. It's low sudsing. It's perfume and dye free which makes it perfect for those with sensitive skin. This is a terrific product! This is an awesome laundry detergent is in great bulk and 5 gallons. It was sealed very well no leaks! It is a trustworthy brand. Amazing!